It’s uncertain, to know Deruta’s actual origins, or the etymology of its name. Various hyposthieses derived from inspiration of antiquity and multiple denominations of the area, were distinguished by different names-during different eras; Ruto, Ruta, Direpta, Druida. In the end, the name Deruta had been stabilized. We can say that its name was conceived as a variant of the onomastic “Diruta” meaning “destroyed”. Earlier than the medieval period, no specific knowledge of Deruta’s past is available. A great part of archeological discoveries came about towards the end of the 19th century, proving the existence of Neolithic or agricultural settlements in its immediate neighborhood. There are abundant testimonies of residents during the Roman Epoch. Confirmed were fragments of inscriptions, amphora’s, sculptures and top sections of columns conserved in the foyer in the city’s municipal. Very scarce, on the contrary, were settlements of Etruscan peoples. Some patriotic memories can be referred to around 990 when Emperor Ottone II had to compensate a few German Barons, in granting them land and entitling them “Nobiles de Deruta”. In 1264, Pope Urbano IV died, as he travelled from Todi. In 1312, the leader of the ten of Perugia feared that the Imperial militia of Arrigo VII could possibly damage areas subjected to the city– arranging a reinforcement defense. 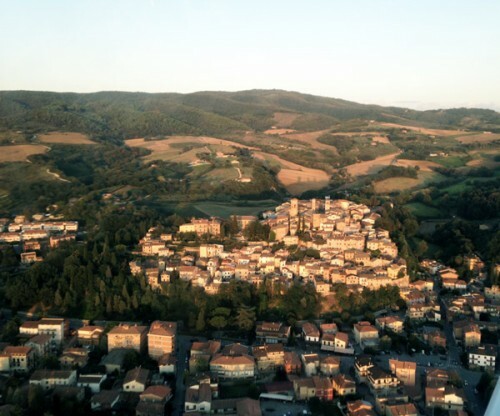 In the year 1370, the church’s army, aspired to reestablish a leadership in the rebellious towns of Perugia; Todi, Spoleto, Città di Castello, Gubbio, Viterbo, Ascoli Piceno and other towns conquered countryside lining the city—which devastated Deruta and Pontenuovo. In the end of 1300, Deruta was often a theatre for military conflictions between Perugine refugees and the army of the dominating city. Biordo Michelotti, captain of the Perugian army, based his troops there around 1395-97. They victoriously confronted the refugees and Giantedesco nicknamed Broglia from Brandolino led the way. Then in 1400, Deruta and Perugia survived with the likes of Giangaleazzo Visconti. And in 1451, arrangements were made for the restoration of the city’s walls; with the opportunity for rebuilding the wall. The walls were reduced in correspondence to the North-East, toward the hill of battle. In a place called “le Cerquelle” they were still visible towards the end of the 1700’s, so were traces of the antique fortification. Between 1456 and 1477-78, a great plague ravished Perugia and its surrounding villages. Deruta suffered too, and they kept track of their diminishing population. 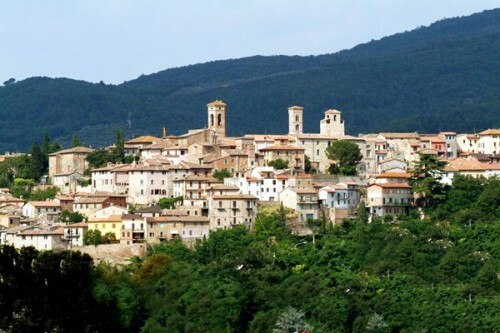 Starting in the mid 1500’s Deruta also, like Perugia enjoyed a lasting period of peace, during the time of reorganization of their social and political life. The production of majolica joins in during this period, with a maximum development and the most ample diffusion. Towards the first part of 1600’s, the city assumed a stable economic and social stability, but also acquired a role of fame in confronts to other centers nearby. In the 18th century Deruta worried still about improvements and renovation. It’s in these years that the archival reconstruction of the communnity (1744) began. A census was well stabilized with inhabitants (1784), the restoration of the internal streets and the project revival of the antique hospital S. Giacomo (1751). 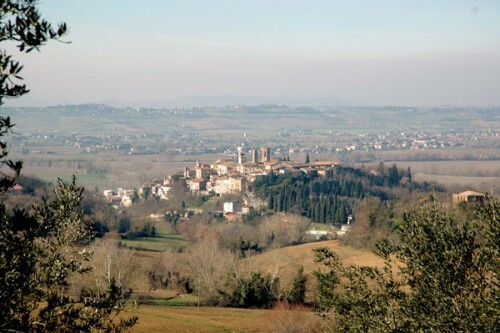 Deruta hangs over a hill at the feet of high ground covered on a sharp Mediterranean patch, in which a natural division is constructed along a vast marsh of the Tevere river. The morphologic characteristics of the territory vary from zone to zone. One of which is Fosso della Rena, Molinella, and Piscinello which have produced cliffs. Soils here are composed of fluvio-lacustrine especially to the left of the river, and deposits of silt-clay — a medium to high plasticity, which provides for good raw materials in the production of ceramics. The land’s fertile soil supports the cultivation of grains, sunflowers, vegetables and fruits. Deruta identifies itself with the manufacturing of artistic majolica. The most ancient eivdence regarding this expression of art dates back to 12 August 1290, and testifies a payment “in kind” against “unam saumam vasorum”. That was the archaic period during which objects of common usage were manufactured: beakers, basins, bowls, “panate”, meagrely decorated, mainly with geometric and animal patterns. The prevailing colours are green “ramina” and manganese brown . during the subsequent centuries majolicas from Deruta reached the highest splendour and expanded in the Sixteenth Century in the main marketplaces, not only the Italian ones. Artists such as Giacomo Mancini (“El Frate” that is “The Friar”) and Francesco Urbini realized works of of prominence. Display plates, amatory chalices, straw-botiomed chalices, nobiliary armorial bearings show a range of patterns with female characters, mythological scenes, battles and Holy images. There are other several, different and original patterns, popular in that period: floral, zoomorphous. Grotesque, floral curls, peacock’s-feather’s eye, crown-of-thorns, wolf-tooth and petal-back like imbrications. In the meantime the range of colours became richer, and added the orange, the blue and the yellow. The technique of metallic lustre, characterized by splendid golden reflections, began to appear in the most valued works. The first “lustre” piece, ascribed to Deruta, dates back to 1501 and it is a bas-relief representing the martyr of Saint Sebastiano, it is preserved in the Victoria and Albert Museum of London. Floors, such as the floor of the Church of St. Francesco in Deruta, of St. Maria Maggiore in Spello or of the Sacristy of St. Pietro in Perugia, are further evidences of the best Deruta majolica production. In the course of times, the style and the decorative patterns have turned into the “epitomized” style, consisting of quick strokes, and the “calligrafico” (minutely-finished) style, of Moorish inspiration, consisting of twisting of flowers, leaves, arabesques, birds and other animals. In the XVIII century there was a period of crisis during which – nevertheless – a reaction was represented by Gregorio Caselli, who established a factory of fine majolica, in imitation of porcelain, in Deruta. In the present days the high level of artistic production is to be found by visiting the “living museum” stretching across the streets of Deruta, made of workshops, laboratories, factories, show rooms, where you can attend freely to the various steps of the production process. That is a reality to be found in the territory, as well, such as Ripabianca, known for the manufacturing of vases, oil jars, pitchers and terra cotta jugs. An other form of traditional activity was handed down to Saint Niccolò from Celle through the working of wickers and of “scarza”, a material for chairs, baskets and other objects for interior decorations. of Deruta finds its origin in the rural tradition , therefore in the use of the seasonal local resources, with a particular characterization during the solemn or traditional festivities: Christmas, Easter and Carnival. The most favorable occasions in order to taste typical plates, are the several home festivals which take place from June to September. Some original courses are the “tagliatelle” (kind of noodles made of egg-based dough) with goose’s bowels, the ham pie on the baking pan, grilled vegetables or pork sausages, beans and pigskins, roasted chicken, pork, lamb, as well as Chicken and Rabbit “all’Arrabiata” (with particularly spicy sauces, with red pepper), chickpea soups, “gnocchi” (a kind of little balls made of flour and potatoes) with goose sauce, the “bruscatella” (roasted bread seasoned with Olive Oil and garlic) and the “panzanella” (wet bread seasoned with fresh tomatoes, sweet basil and Olive Oil). The cheese pie is typical of Easter whilst the “torciglione” is a typical course of Christmas. We also recommend the “torcolo” made of sweet paste, candies and raising, to be tasted with a glass or more of “vinsanto” (fine dessert wine), and also the “ciaramicola” and the traditional Carnival pancakes such as the “strufoli” and the “frappe”.